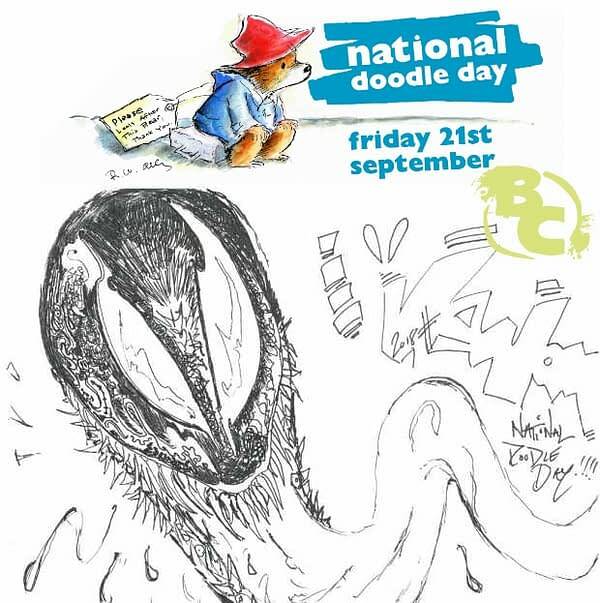 National Doodle Day is campaign from British charity Epilepsy Action. During which, they get a variety of artists and celebrities to draw doodles, which they then auction off. This year that includes people such as Grayson Perry, R Alan Ayckbourn, David Baddiel, Derren Brown, MacKenzie Crook, Warwick Davis, Miranda Hart, Harry Hill, Jessica Hynes, Danny John Jules, Kris Marshall, Miriam Margoyles, Joanna Lumley, Brian May, Jonathan Pryce, James Purefoy, Alison, Steadman, Zoe Wanamaker and many more. But they also got a rather timely one with a certain movie on its way. A sketch of Venom by Tom Hardy. Oni Press Has Rick & Morty Treasury Edition for Local Comic Shop Day 2018. Obviously.